Rocktober! Day 25 | Awesomeness For Awesome's Sake. Hoo boy! This is it, kids…the home stretch! The final week of Rocktober! It’s been a quite a month over here at Awesomeness…I’ve lost some regular readers and gained some new ones thanks to my 31 days dedicated to two of my favorite things. It seems that heavy metal and horror for an entire month can be a bit tedious to some readers who prefer a little more variety from one Mr. Canacorn. Well, never fear, my little ones…We only have seven days left and then the old Awesomeness you’ve come to love and respect will be back on track. I hereby promise you the return of, not one, but two old favorites…MAN-UP MONDAYS and FETISH FRIDAYS will be back starting in November! Okay, now that that’s out of the way…on to the 25th day of (the soon to be over) Rocktober! Why look who it is? 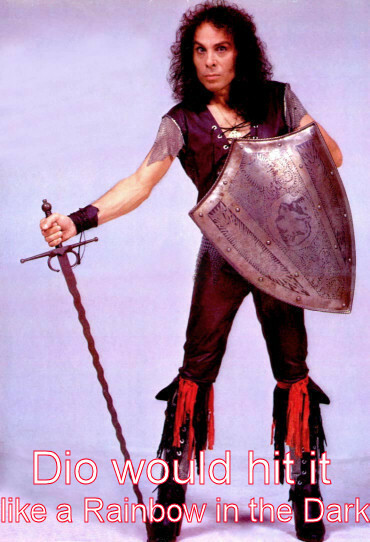 It’s Ronnie James Dio, everybody! This magical little man has quite a history weaving horrific imagery and metalistic riffage into some of the best heavy metal songs ever written! Like the one we’re going to watch today. It’s the title track from from Dio’s second album, The Last In Line! This is a record that belongs in everyone’s record collection! I’ve only heard the first two Dio albums and the first two he did with Sabbath. Is everything after that competely crappy? I hated that Rock n Roll Children. Not totally crappy, but you have what you need with his Sabbath stuff and his first 2 LPs. That little fucker can still wail though. I love people that are my height.